I'm not sure if it's true, but my understanding is, that something cannot be called "antique" unless it is at least 100 years old. The china used in this table was handed down from my Great-Grandmother, to my Grandmother, to my mother and finally, to me. I'm not sure when or how my Great-Grandmother got this set but a little math tells me it has to be around 60 to 90 years old. So while not quite "antique" by the formal definition, it is old, and therefore, vintage. The marking on the back says Epiag Czechoslovakis. It is rimmed in gold with a black pattern all around. I started with a white tablecloth and used shiny gold scrapbook paper for the charger. This set has not only the place settings for 8 but some serving pieces have also survived over the many years. 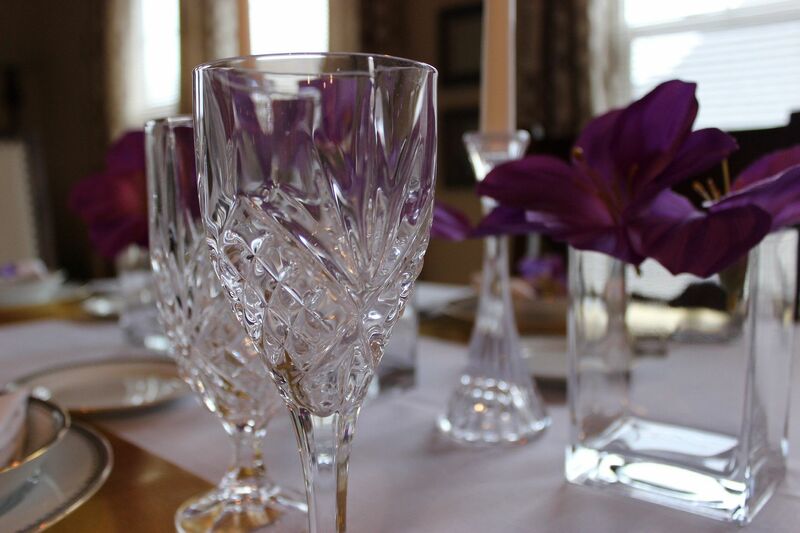 My Godinger crystal brings out the true elegance of the china. As do the crystal candlesticks, a gift many years ago, from my oldest son. 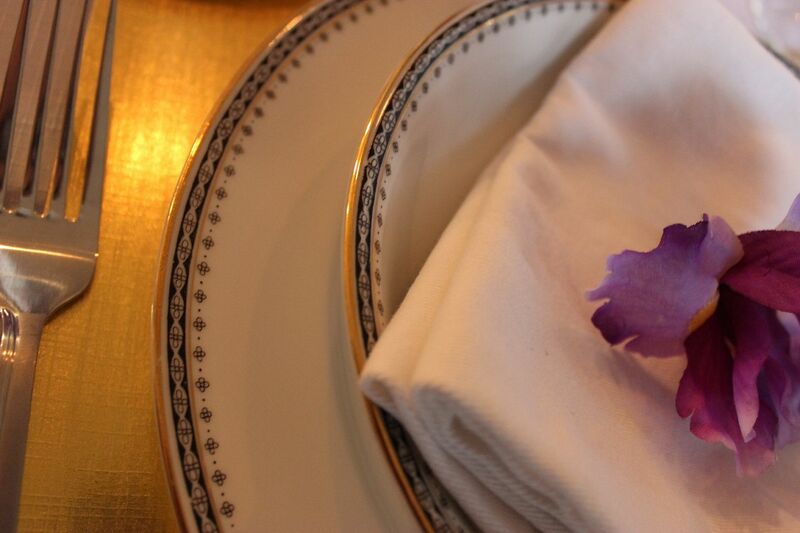 A white napkin, topped with a faux iris bloom, is nestled in the soup bowl atop the dinner plate. 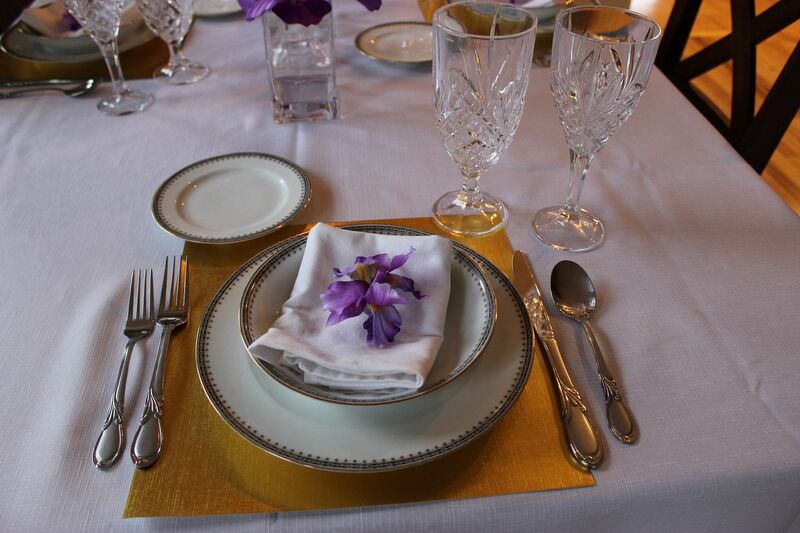 The flatware, though not real silver, help to bring out a formal sense to the tablescape. 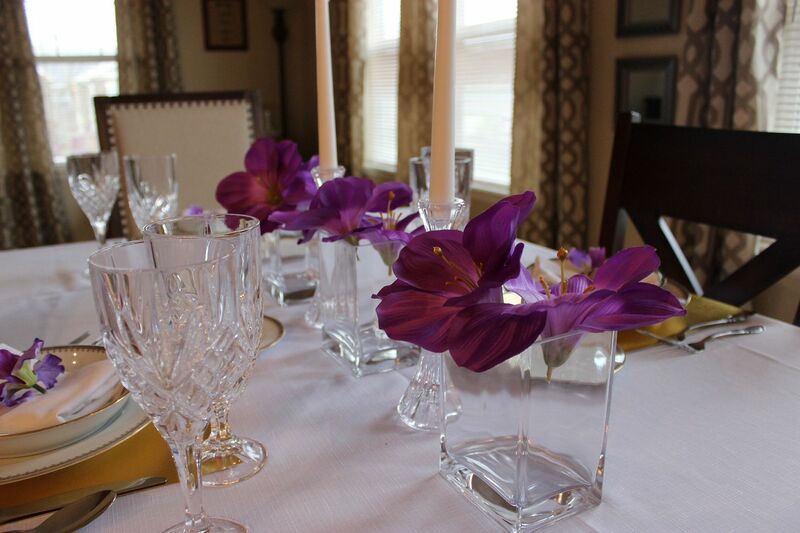 The centerpiece was kept simple, just 3 clear square vases from IKEA, with bright purple faux hibiscus flowers. A table set to honor those special women that lovingly used these very same dishes in the past, and to showcase them for some special woman that may possess this piece of family history, in the future. Maybe by then, they will truly be known as, antique. Like what you saw today? Well then, don't miss any new posts! I have a confession - I use my fancy china every day. It was my Aunt's wedding china and she gave it to me. I explained to her that I don't believe it keeping dishes for special occasions (because I don't like stuff) and she was fine with that. It's in our normal rotation, it goes in the dishwasher, and I've even broken a few pieces. Looking at your tablescape makes me think that maybe I should treat it a little better. Sorry for the broken comment, again, as a legal student, and as one of my two undergrad majors was Art History, I can tell you that the term antique does not refer to an age of 100 years. It actually began in the French legal system, was adopted by the English law, and was reverted to anything over 25 years of age; this system was carried over to the emergence of the American colonies to states. Antique property, is property not worth any personal value, but value bearing to an estate. In terms of both art and property, age devalues all objects; this can be seen in purchase a tag for a vintage car, you actually pay less for the state tax on the tag as the car is worth less to the state, but the appreciated value is significantly higher to collectibles. Collectible value, on the other hand, is an eye-of-the-holder premise, and value is appreciates by 1/8 per fiscal decade. This is applied to common good, auction houses, and the like. Regardless, your china is lovely! I just thought I would share! I just love that china and it's even more beautiful because of it's history! I think the table is especially beautiful being that purple is my fav! 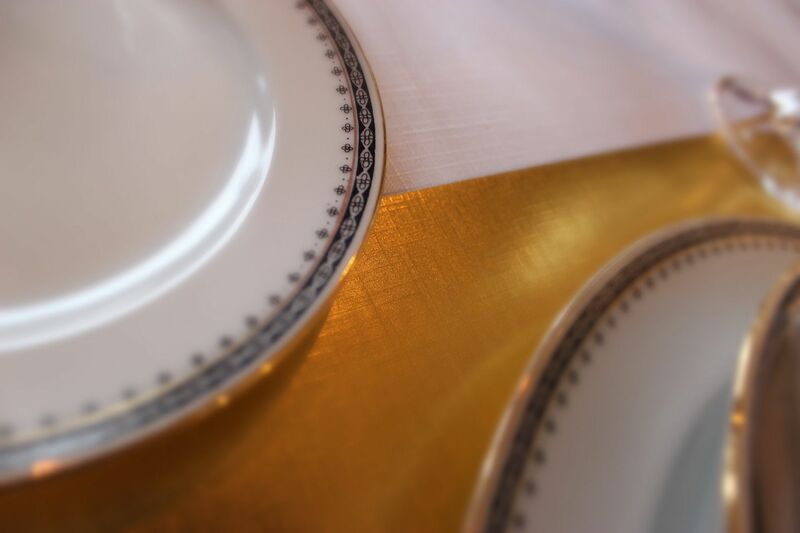 Can you imagine how cool it would be for future generations to receive this china with a copy of this post?! I love all things vintage and I absolutely love your china that has been passed down from generations. Just think of all the fascinating people that have eaten from your china. I love this!! These pieces are just gorgeous, I love old crystal and china, just the feel of them makes me happy. I think because they have absorbed so much love over the years! It's like the wood on old furniture! 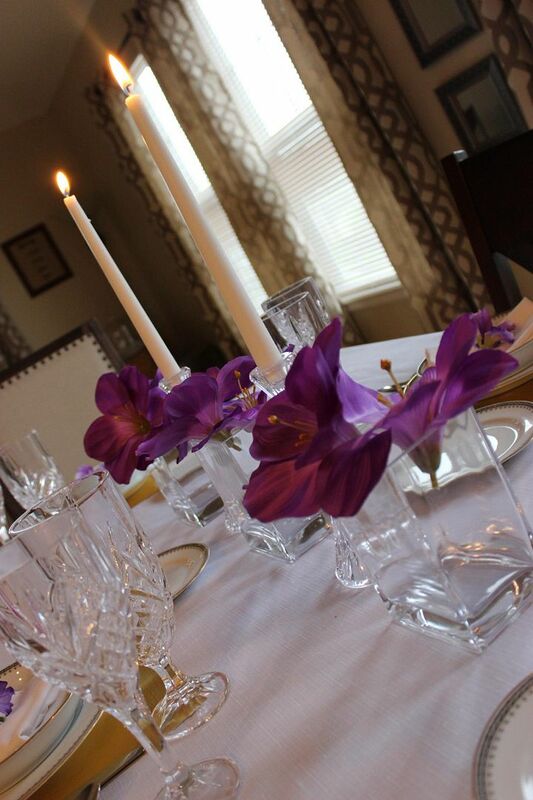 I always love to set a beautiful table but haven't ever taken pictures (so sad huh). My family calls it me playing tea party, Ha!! Beautiful and I love the story behind it. I would love to get a full set of china... I have just a few pieces that I have bought here and there. Gorgeous! The plates and iris are stunning! I love the pop of purple! Beautiful. I'm obsessed with vintage things. 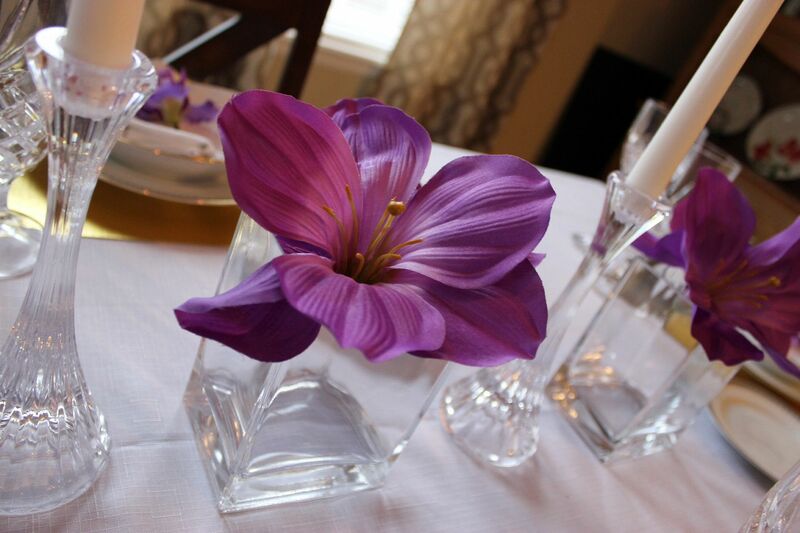 I love the hibicus makes a beautiful center piece. I just loved the way you set it all up. The purple and gold are beautiful together! What a lovely setting! The pops of purple are just perfect! Thanks for sharing! Timeless. As beautiful today as it was then! Beautiful china! It really is such a lovely pattern and the table is so pretty! Great job! I love things with a family history. 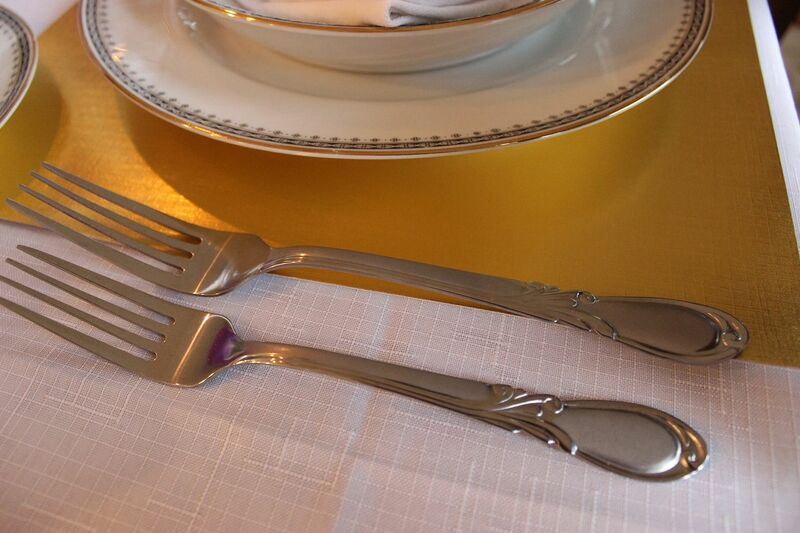 Your china is beautiful, and I like how you used the purple! 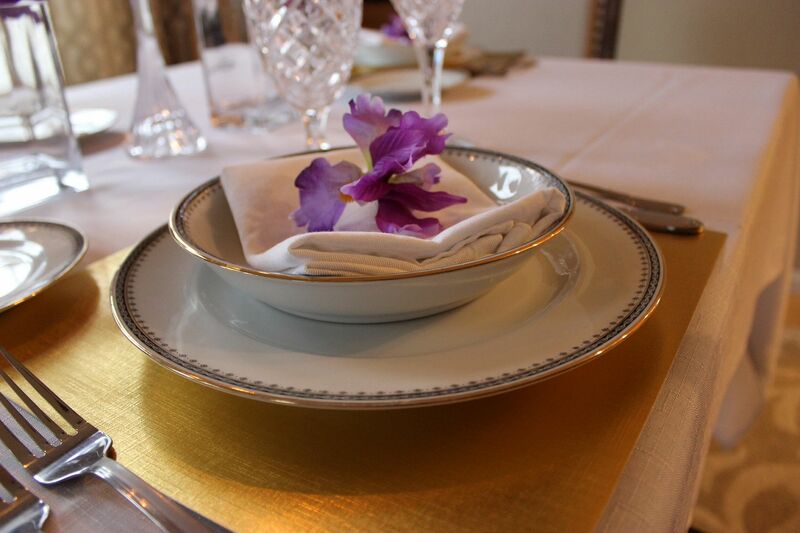 Your lovely, yet understated tablescape really allows the china to be the star! Have you thought about using a black tablecloth? I think it would look spectacular with the china (and gold "chargers") and in the room. IKEA! I can't wait for it to get here in the fall!!! When I motor past the spot where it's being constructed, I feel almost obligated to get out and kiss the ground or something! I'm so excited!!! No matter its qualifying definition, your great-Grandmother's china is beautiful! I like the traditional nature of it. It's a pattern that can be interpreted in so many different ways...and that makes it just as utilitarian as it is beautiful! Have a wonderful rest of the week, Kathe! Wow, that is so neat how many generations have had that china. Very cool. 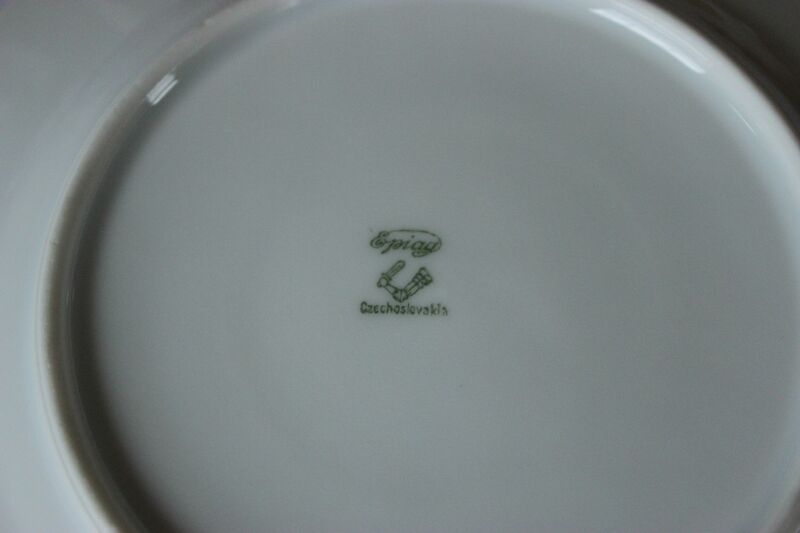 Don't you love knowing the history your china has? I always wonder about the stories that might have been shared around other tables where it was used. Such a beautiful table. I love the simplicity of your table....and that china is really pretty..
Well, it's beautiful no matter what you call it. You are lucky to own something so nice passed down. The table is fit for a queen! There is nothing in the whole world I like more when it comes to china than a pattern that is vintage or antique and has been handed down in a family. Yours is just elegant to me. I love the simplicity of it, and the fact that that banding on it gives it a uniqueness. It is truly a family treasure. Your Antique China is beautiful. Very stunning and elegant. Love it! Love the purple. Very pretty. Thanks for sharing. 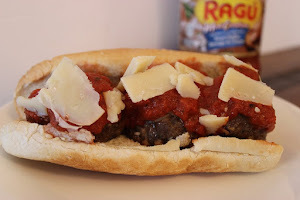 Visiting from "Thursday Favorite Things". Beautiful pattern, and certainly special that it has been passed down through the generations. The purple flowers are a perfect compliment. You set a gorgeous table. Gorgeous table Kathe. 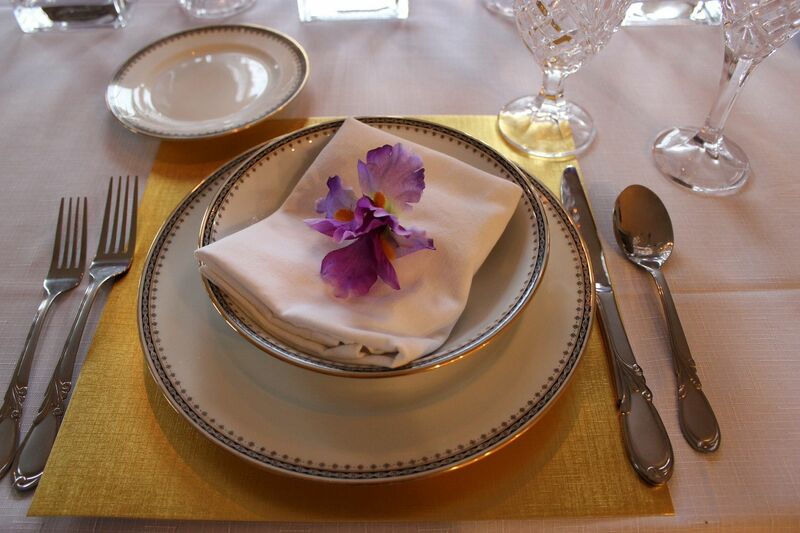 The crisp white tablecloth backdrop really shows off your gorgeous china. And you know me...anything purple always gets my attention! 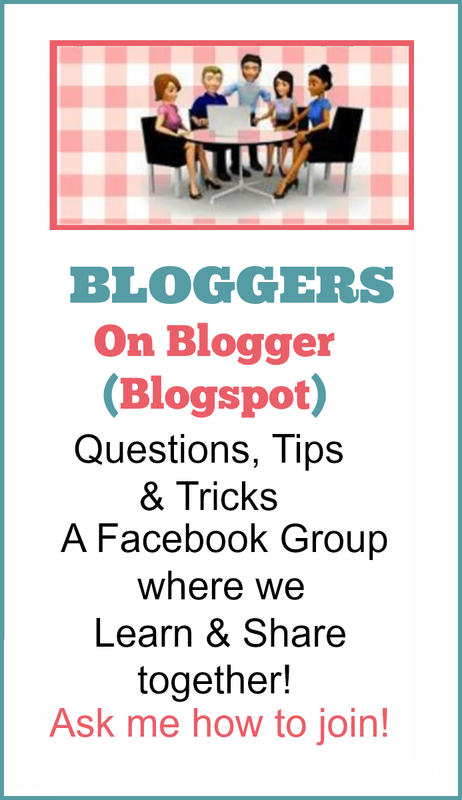 Thanks for linking up and sharing my Table It Link party. 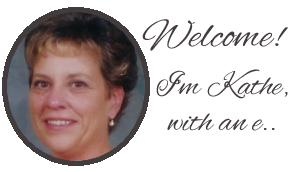 I really appreciate it, you are a true blog friend! Lovely dishes and lovely table! I love the way you added the iris accents. Gorgeous, Kathe, and it's remarkable that vintage china pattern looks so modern today! I guess what goes around, comes around? LOL! 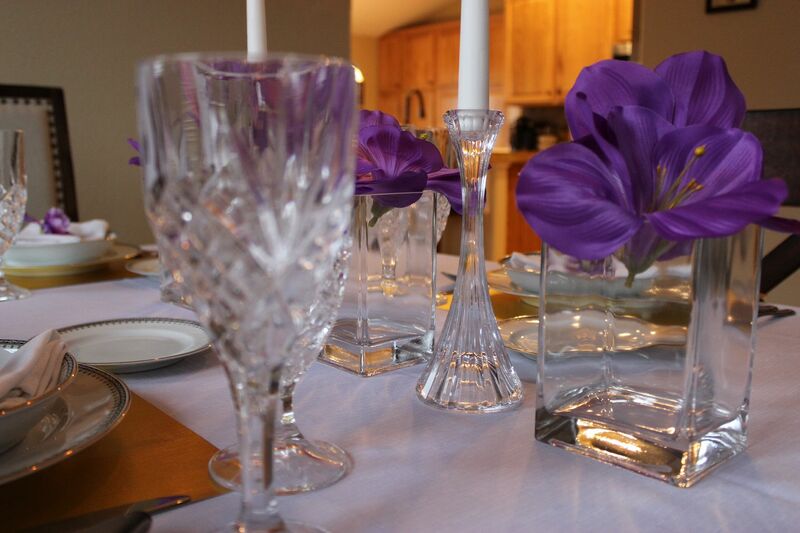 You set a stunning table with your treasured dishes -- your great-grandmother is smiling, I'm sure! I would LOVE a set of china. A real set. Oh my dishes match and all that but they are not china. They are stoneware I think. Anyway, they serve our everyday purpose. I have always wanted nice china and crystal but it does not fit our lifestyle.........I should say those who live with me, it does not fit theirs haha. Life is too short...we should use the good stuff every day! 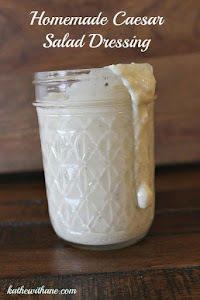 Thanks for sharing this on the Thursday Blog hop! Whether vintage or antique your china is lovely. The simple elegance of the simple gold and black bands is timeless. As beautiful today as it was the day your great grandmother first set her table with it. 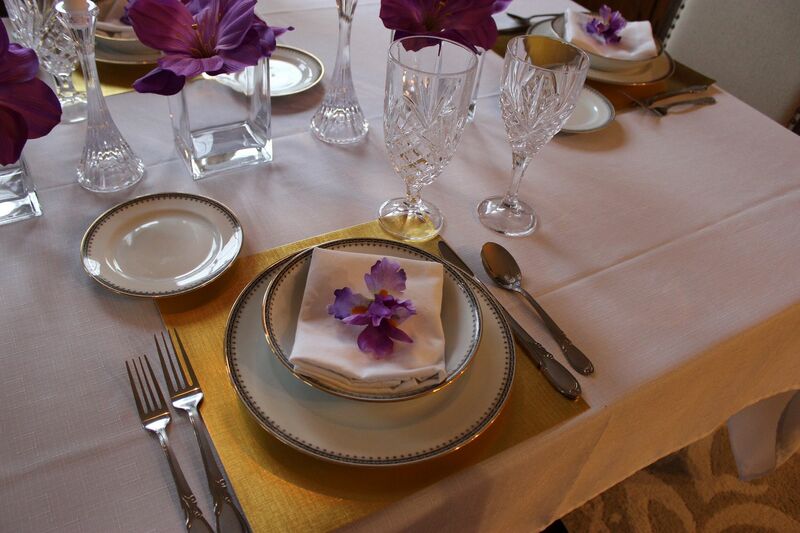 The tablescape you have created to compliment the china is beautiful. Beautiful table, Kathe! The china is so lovely! I love the iris accents. Great job and hanks for taking the challenge at Let's Dish! Gorgeous!! Thank you so much for sharing your creativity on The Inspiration Board at homework. You were featured in the spotlight! Thank you for sharing at Tuesdays with a Twist! Hope to see you again this week! 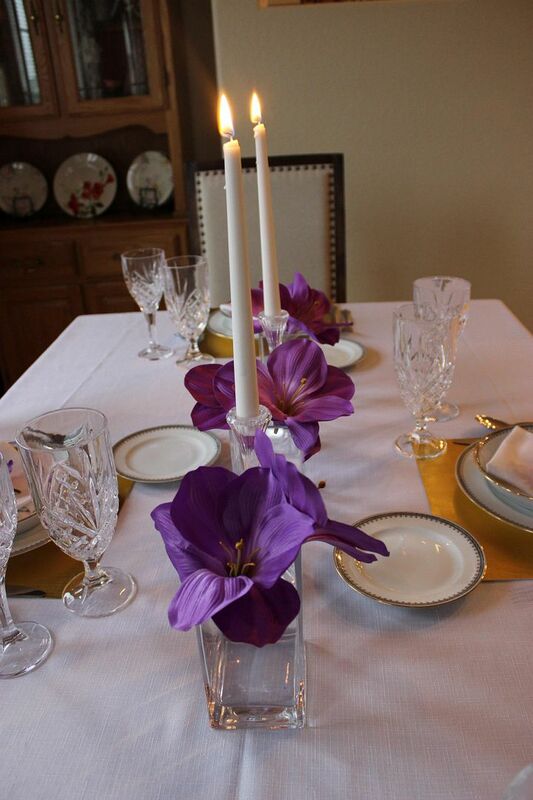 Beautiful table Kathe! 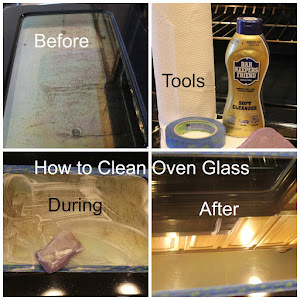 Thanks for linking up with HSH!